If you don’t want to receive your HDFC Bank Credit Card Physical Statement on your postal address, than there is a way to deactivate HDFC Credit Card Physical Statement. Deactivating HDFC Credit Card Physical Statement can be done with various methods, and here in this post we will mention both the methods available to deactivate HDFC Credit Card Physical Statement. Deactivating HDFC Bank Credit Card Physical Statement will help towards saving the environment, but you will continue receiving your monthly HDFC Credit Card e-Statement on your registered email id instead of paper statements. To stop HDFC Credit Card Physical Statement Online you should have HDFC Bank Internet Banking Service Enabled. So now just login into your HDFC Bank Internet banking by entering your user id and password by clicking here. Once you are logged into your HDFC Bank Internet Banking Account, just click on Cards tab > Credit Cards > Request > Physical Statement Suppression. Just select your credit card number, select type of your email id from personal or official id, enter your email id below, and click on continue button. On next page it will mention that you will receive one time password on your email id and mobile number, so to proceed just click on continue button. You will receive one time password on your registered email id and mobile number, you will have to enter that otp in input otp field and click on continue button. That’s it you have successfully deactivated HDFC Credit Card Physical Statement, it will show you reference number of your request on the page. You will not receive your Credit Card Physical Statement on your postal address anymore from the next billing cycle. To discontinue HDFC Credit Card Physical Statement Offline just download HDFC Credit Card Discontinuation of Physical Statement Request Form by clicking here. 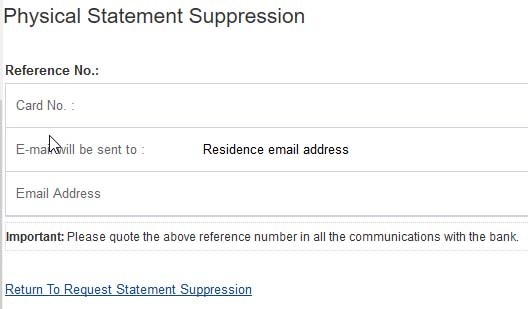 Once you download the Discontinuation of Physical Statement Request Form, just take print out of the form. You can even get this Discontinuation of Physical Statement Request Form free of cost from HDFC Bank Branch. Just fill in all details asked in the form and post it to the mentioned address in the form, or else if you have taken the form the branch than submit the duly filled form to your branch.